석가불을 단독으로 그린 비교적 작은 크기의 괘불이다. 이 그림은 화면 중앙에 큼직하게 연꽃 위에 결가부좌 자세로 앉은 석가의 모습을 그린 그림이다. 등 뒤에는 금빛 광배가 있고 붉은색에 녹색이 섞인 옷에는 꽃무늬가 뚜렷해 밝고 화사한 느낌을 준다. 머리는 감청색의 곱슬이고 얼굴은 원만하며 몸집은 단아하다. 오른손은 마귀를 누르는 듯 무릎을 짚고, 왼손은 엄지와 검지를 맞붙인 항마촉지인의 손모양을 하고 있다. 이 괘불의 석가의 모습이 오른손이 크고 팔이 유난히 가늘고 긴데 이것은 안심사의 영산회괘불탱(국보 제297호)과 곡성도림사의 영산괘불탱(1683년 작)에서도 볼 수 있는 표현으로 조선 중기 괘불의 흐름을 알 수 있게 하는 귀한 작품이다. 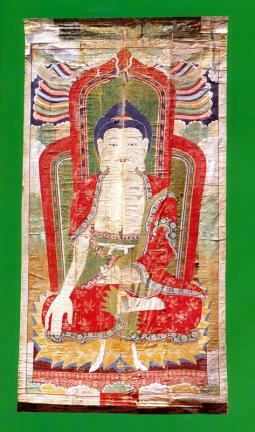 This painting of Shakyamuni Buddha is small for a hanging painting. The Buddha sits cross-legged on a lotus flower at the center of the canvas. The picture also displays a gold-colored mandorla. The red and green colors of the floral-patterned robe create a bright, pleasant atmosphere. The hairs of the head are curly and deep blue. The face is well-rounded, and the body looks graceful. The thumb and the forefinger of the left hand are touching each other with the right placed on the lap, symbolizing an act of repressing evil spirits. 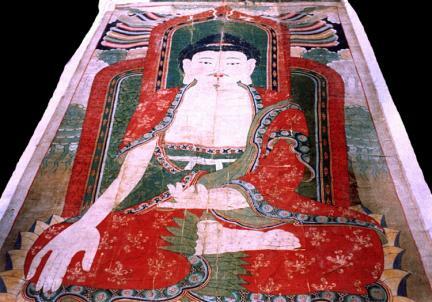 The image of Shakyamuni Buddha shows a noticeably large right hand and a long, thin right arm. This feature is also found in the Hanging Painting of Ansimsa Temple (The Vulture Peak Assembly, National Treasure No. 297) and Dorimsa in Gokseong-gun (made in 1683). The paintings are precious materials that help researchers see the flow of hanging paintings made in the mid-Joseon Period (1392-1910).